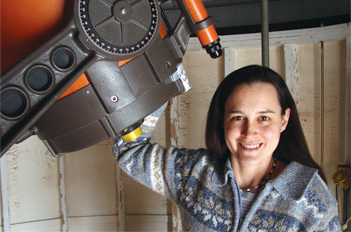 Dr. Maura McLaughlin, assistant astrophysics professor at West Virginia University, has reached astronomical heights in her young career. In 2004, she was part of a team that discovered the only known double-pulsar system – two pulsars locked in close orbit around each other. She was part of a team that discovered 17 new millisecond pulsars. And she recently received a $6.5 million award from the National Science Foundation to launch an international partnership for detecting gravitational waves. If they succeed, their discovery will be vastly transformative for physics in general. Dr. McLaughlin engages teenagers in the search for pulsars at the National Radio Astronomy Observatory in Green Bank, W.Va.
Read more about Dr. McLaughlin’s research in the Winter 2011 edition of the Neuron.